Li: In 2001 I was invited by a gallery in Australia to talk about an exhibition. Your wife Meng Fan was working for the gallery at that time. She was the one who received me. So when I was preparing materials for that exhibition, I also heard from your wife that you had been working on a batch of works in Dongbei. These works later brought you international fame. But now we will start from the beginning. When did you graduate from the art college? And what college? Shen: I have never been to art college. I studied art history for three years in Harbin College of Education. Li: When did you start making art? Shen: I started making prints in 1979. Li: Are they in the ‘Prints of the Great Northern Wilderness’ style? Shen: Not really. The materials I used were different. I used oil paint and industrial paper to make the prints. It was reported in the China Art Weekly. I also published an article entitled ‘Repeating no one, not even oneself’ in the paper. And I was also awarded an honorary mention in the National Art Exhibition. But later I decided to quit print-making and started working on fabric in a textile printing and dyeing factory instead. The principles are similar. I used defectively printed textile, or simply asked friends to produce textile with imperfectly lined patterns for me, then creased the fabric up to create the kind of ‘flying white’ effect you see in Chinese ink-wash painting. I felt that the texture that was created this way looked better. Alternatively you could also have the rolling blocks used in textile printing misaligned. The pattern created this way is a bit fuzzy. It works in the same way as ‘kiln accidents’ for pottery, in the sense that they both create un-premeditated and unexpected results. After printing the textile, I burned the edges with a candle, turning it into a kind of soft sculpture. I made a batch of works like this. They were exhibited in China once. After that, I went to Australia. Li: In what year did you go to Australia? Shen: In 1989. Back then, I was still making prints. I went to Australia to attend an international prints conference. I came back to China for a month after that. Then Red Gate Gallery invited me, together with two other artists, to stage an exhibition in their space at the ancient observatory. Later a university in Sydney invited me to visit for three months. So I went back to Australia again in 1990. Li: When did you make the work with bones, the one that brought you instant fame? Shen: It was a project I worked on from 1998 to 1999. This sort of work was hard to produce in Australia. First of all, their animal protection organizations opposed to the idea of using bones in artwork. Secondly, the cost of materials and labor was also very high. I was under quite a lot of pressure at that time. Later something else brought me back to China before that project was completed. So that batch of works was completed in Dongbei. There were several advantages in Dongbei. For one thing, slaughterhouses in Dongbei were not as highly mechanized as those in Beijing. In Dongbei there were a lot of small-scale slaughterhouses. They tended to leave more bones intact, and in larger pieces. These were more suited for use in my works. I needed a large quantity of bones and my friends in Dongbei were also very helpful. That was another reason why I ended up making the works there. The bone pieces I used ranged from ox bones to rat bones. Even human bones. But the human bones were bought from the Institute of Anatomy of the Harbin Medical School. Li: What is the idea behind the work? The first time I saw it was in the X-Ray Art Centre of Beijing’s Chaoyang District. I remember the deformed small creatures in egg shells. Were they the first pieces in the series? Shen: They were not the first pieces. The first one was an anonymous creature made of bones from fifteen cows. I stretched the torso of the creature and restructured its head, turning it into a monster with three heads and eight legs. Then I carved scripture texts from three major religions on its skeleton. The texts came from the Buddhist Diamond Sutra, the Koran and the Bible. The words in three languages were jumbled together, giving it the look of absurdity. I think wars among different nations or nationalities can often be attributed to religious differences. Li: All religions teach people to do good. But somehow, collision between religions seems unavoidable. The ideal and the reality often don’t go hand in hand. Shen: That’s why I created the three-headed monster. Probably as a result of my atheist tendency, I believe that religion belongs to the realm of the ideal – a world apart from reality. The idea prompted me to make that piece of work. The three heads share one body but each one of them looks in a different direction. It makes you uncomfortable looking at it, as if sensing continuous and inevitable conflicts. Li: When I first saw your egg work (Unknown Creature no. 9) I thought it tried to convey a sense of confusion and uncertainty towards modern civilization. The rapid development of bio-technologies, such as cloning, makes one worry. How do you feel about that? Shen: Precisely. In the egg work, I tried to make people think carefully about all of the confusion that scientific development has got us into. Will science lead us to happiness or disaster? With the unlimited potential of science, will viviparous humanity ultimately become oviparous? The possibility of mass producing human beings in factories cannot be excluded either. Li: What other works did you make after the eggs? Shen: After the eggs, I made a series of works on the theme of experimental fields, including Experimental Field no. 1 - Pea Pods, Experimental Field no. 2 - Chinese Cabbages, Experimental Field no. 3 - Poppy Flowers, Experimental Studio no. 1 - Flowers, Experimental Studio no. 2 - Sunflowers and Experimental Studio no. 3 - Dragons, etc. I carried on using bones and bone meal in these works. For example in Poppy Flowers, I used bone meal to make beautiful poppy flowers. But if you look at these flowers in detail, you can still see the remnants of animal skeletons. For instance, the petals were constructed with bones of rat claws, and flower buds were made from rabbit skulls. And you could see the constituent skeletons if you looked closely. The details are actually very scary. They give the sculptures a hint of the beauty of horror. Li: They appear beautiful at first sight, but the longer you look at them, the more sinister and horrifying they become. It is precisely the feeling I got when I first looked at your poppies. Somehow they remind you of their association with drugs. Shen: They evoke all the things and feelings that lie behind the beautiful flowers. After the poppies, I made Thousand Hand Guanyin Bodhisattva and Dragons, and later the four pests, such as mosquitoes, etc. They are no fully completed yet. I used the skulls of cows to make dragons, and I made them look like authentic unearthed artefacts. Dragons are imaginary creatures. These creatures – seen as a symbol of China - possess a composite of features from different animals. I made them with genuine animal bones, and even gave them a weathered effect to invoke a sense of genuine existence. I also made dragons in different stages of physical development. The thing is, if scientists can create rats using the material from a human brain, then nothing is impossible in the world. Li: Alongside every step of scientific advancement, humanity creates a trap of the same magnitude for itself. It is the inescapable paradox of human existence. Shen: I am entirely convinced that scientists are capable of creating dragons. I used the bones of rabbits and rats to create a dragon foetus in formation. A man-made dragon was created out of animal skeletons, and later a man-made Thousand Hand Guanyin Bodhisattva out of monkey bones. I also constructed skeletal frames of children from monkey bones, and Guanyin’s hands from real skeletons of human adults. Li: Did you mention that you started working on a piece of work about Tiananmen? Li: Are you waiting for inspiration? Shen: There will be at least one more piece to make, that is to use my own bones to bring my artistic journey to a finale. But since I am still enjoying my life, it will have to wait. When it’s time, I will make my assistant construct something with my own skeleton, using the same method and engraving my life experiences on my own bones. Li: I am sure there are other people who want to donate their bones for the use of your artworks. If I die before you, you can use my bones to create something. Ha! Ha! Shen: There then. Try not to upset me, otherwise I might engrave your name on my sole. But if you get along with me, your name can stay on my skull instead. Some people seem to think that I only make one type of work. But they are only works from one stage of my life. In each stage, I choose a different material. An artist’s works reflect his/her experiences. Your experiences lead you to certain things. Take, for example, the cloud pillars (huabiao) that I made. I used them to make a piece of work about ‘process’ – from transport to installation. When they were displayed in Britain, British people’s attitudes toward them were rather similar to Westerners’ attitudes towards the Chinese people. They wanted me to exhibit my work in Britain, but they didn’t want them erected in the exhibition space. They thought it would be just fine to have the columns lying on the ground. The columns were huge, so they thought it would be dangerous and costly to erect them. It would have cost forty thousand pounds to dig a very deep hole for the foundation of the erected columns. I have kept all the emails from my communication with them. And I plan to make an album of them. We are all familiar with the China Threat argument. This inspired my first idea about the piece of work. Cloud pillars functioned as a way of remonstration when they first appeared in Chinese history. They were erected in the street for people to write on them their opinions about the regime and the authorities. At the beginning they were made of wood, and later of stone. Even later, they were garnished with carvings of dragons and used to decorate palaces and temples. So huabiao columns became a symbol of power and authority – an exact opposite to its original purpose. It is also why I decided to make this piece of work. Nowadays huabiao columns often appear in adverts as a symbol of China. I think it works as a kind of cultural export. Everyone knows that there are huabiao columns in Tiananmen, so their natural background has always been the Tiananmen. But when they were displayed in Britain – the first capitalist country and the first democratic country in the world – there was a church in the backdrop. Somehow the change of background changed the feel entirely. It was exhibited as a site-specific installation. The only condition of the exhibit was to erect them only for a while before they were laid back down on the ground. Li: So were they erected in the end? Shen: Yes, they were. With the help of two cranes and one hoist. It was a lot of work. Later the colums were assembled on the site. Li: Were they eventually laid back down again? The process sounds interesting. Shen: I made a video and took hundreds of photos of the whole exhibition process. A German photographer there recorded the process with large pictures. They didn’t want the columns erected because of safety concerns. When the columns were being assembled, they barred the site off with security lines. Li: And the work was placed outside a church? Shen: Yes, as an outdoor installation. But later, I sort of felt that the security line barrier became part of my work. Li: What about the work about the Tiananmen? Shen: I am still making it. The part on the ground is completed. When I returned to China, I felt that everything we do in China tends to exaggerate things. We have a leaning toward extravagance. On the web I found a few county-level courthouses in China. They were much bigger than the state-level courthouses in Australia. Li: I also found a few town government buildings. They are built in the style of the Tiananmen, totally over the top. It is the result of the nouveau riche mentality. Confucius said of the Chi Family, “They use eight rows of eight dancers each to perform in their own courtyard. If this can be tolerated, what cannot be tolerated?” A mere nouveau riche landlord dared to stage a performance in his own courtyard on the same scale as a Zhou emperor’s court dance! When wealth is backed by culture, creativity and progress is the natural course of development. Unfortunately, when uncultured nouveau riches come into money, they emulate the lifestyle of imperial aristocrats. Why else would property developers in China build so many ‘European style garden villas’ and ‘aristocratic gardens’? How many of these property developers are not upstarts themselves? Shen: Shenyang (capital of Liaoning province) does not have Tiananmen-esque buildings. But it has two White Houses! As a symbol of state power, I don’t think that Tiananmen is quite big enough. Think about it. Even a theatre can be allowed to be so large and so close to Tiananmen! It is obvious that Tiananmen simply is not big enough. It needs to be expanded in the future. According to the design of my present project, Tiananmen will become twice as big in the future. Wasn’t Tiananmen redeveloped once before, some time between 1969 and 1970? It took one hundred days to complete the project. The project made Tiananmen eighty centimeters higher than before. Li: Tiananmen’s height had already raised once in the 1950’s. A lone structure surrounded by such a large square in the middle of a sprawling modern Chinese city, it simply doesn’t help trying to make the gate a little taller. Shen: According to foreign press reports, during the Cultural Revolution, Mao once urged people to dig deep holes for the storage of grains. So they suspected that there might be secret tunnels under Tiananmen Square. Whether it is true, we have no idea. The foreign press was only speculating about the existence of underground tunnels. I reckon, if the government really considers redeveloping Tiananmen Square, they would definitely have plans for the construction of an underground project. So I made a comprehensive plan for the underground project myself, including a model, a structural plan, and a construction plan. The whole plan adds up to a hundred sheets or so. My version of Tiananmen follows the tradition of old building plans, totaling more than seventy sheets. They stretch over fifty meters long when lined together. There will also be an interactive animation program for use of viewers. You can click the mouse and visit any space in the underground project. It is all virtual reality. The underground space has what the over-the-ground Tiananmen has and doesn’t have. It also includes futuristic building materials which are bullet-proof, radiation-proof, poisonous-gas-proof, as well as eavesdropping-proof. Inside the underground space, there will also be anti-violence squads and police, or some kind of militarized forces, stationed there. On top of that, there will also be public showrooms and foot massage centers. Not because the general public need them, but because we need to look after the leaders’ needs. Right? Li: Right. When do you plan to finish the project? Shen: According to my original plan, it should have been August this year. But the project is too large and time-consuming. I don’t think I can manage it. Li: The Tiananmen Reconstruction project will include some small figurines in it. Am I correct? Shen: At the moment, there is an airport in the underground city, as well as many military vehicles and little policemen and soldiers. I’ve made four models. One of them measures six meters long and three meters high. I am very familiar with the Tiananmen Gate. But like everyone else, I don’t know anything about its structure. So the model I’ve made is a diagonal cross-section of the Tiananmen Gate, including all the minute details inside. In other words, it demystifies the Tiananmen Gate, together with the underground city beneath it. In my models, you can see all the details inside these mystified structures. My other set of works – Oil Gaming Machines – is also under construction. This piece includes three life-size oil-pump machines that are altered and remodelled into gaming machines. You can actually play games on them. During the Iraq War, I sat at home and watched television. Somehow the war felt like a game to me, I mean, something like an American blockbuster movie. The way the television station edited the war news made it feel like a game, very watchable and entertaining. So I decided to adopt the concept of gaming in my artwork. Li: The majority of today’s electronic games have a violent tendency. They prove to be addictive to adults as well as children. In our media-dominant society, news about wars and violence are packaged in the same way as electronic games and consumed as a non-material commodity. Just look at the instances of campus violence. A teenager would kill another one as if playing a computer game. Killing is turned into a game. Reality is mediaised and becomes a psychoactive drug to modern man. Shen: I have another piece of work under construction – Venus. Venus symbolises the beauty of the body and the soul. In other words, it is a standard for beauty. Everyone who has been to art college knows that Venus is a classic piece of sculpture, a mythical being. But I want to bring her back to the realm of reality. How does it feel to return an idealised being to reality? With Venus, I will attempt to gauge the distance between the ideal and the reality. Li: Will she have a broken arm? Shen: Yes, she will. But it will be the broken arm of a disabled person. I got the inspiration for Venus from a beggar with a broken arm I saw in the street. The position of his deformity is the same as that of Venus. His scar from the surgery and the armpit hair growing from the scar haunted me. That haunted feeling became the source of my inspiration – the gap between the ideal and the real. LI: This piece sounds interesting. It is about reality and ideals, about truth and art, and about the classic standards of beauty of an era, etc. It covers many issues that beg further rumination and discussion. Shen: It seems as though my artistic journey has turned full circle. My early works, i.e. the works on bones, were about religion and the collision between ideal and reality. Now in Venus, I am coming back to the same idea. Li: When do you expect to finish this piece? Shen: According to my contract, it should be the end of January. This project is very costly. The artwork itself costs RMB170,000, and the documentary film adds more than a hundred thousand on top. My wife Meng Fan has been very supportive. All the money I got from the sale of my previous works has been poured into this project… We are still driving a car that looks like it’s going to break down any moment. It causes a great deal of worry driving it here to see you. The distance to your home is the longest I dare to undertake with our car. Any further, I would be worried about parts falling off it. Li: Has your huabiao column work been collected by the English? Shen: Some people seemed to take an interest. It would be a lot of trouble trying to ship it back to China. It takes hoists to move it each time. That adds to the cost of shipping. You know, I used to think that all the huabiao columns you see in Panjiayuan were genuine, at least until I started to make my own work. I went to the factory and realized that they were all made there. Later I tried to give my columns the same sort of weathered effect as the ones standing in Tiananmen Square. The fake effect they created in the factory is practically the same as the genuine stuff. Li: What did they do to achieve that effect? Shen: They were very secretive about the chemicals they used. They would not allow me to see it. They promised to create the same weathered effect as shown in the photography I gave them. If I was not satisfied with the result, they said they would do it again. And that was that. They did not let me watch, or touch anything. I sometimes feel that Chinese peasants are very clever. Another project I am working on at the moment is about Chinese bonsai, - the potted miniature landscape and plants. I think that the process of bonsai-making is basically the abuse of plants. You grow a sapling, then twist it to make it grow into artificial shapes. Despite the whole deforming process being extremely cruel, people find the bonsai beautiful. Li: Chinese gold fish, Taihu Lake rocks, root carving and bound feet are all examples of Chinese fascination with the aesthetics of deformity. I still haven’t figured out why the Chinese are attracted to it. Shen: The abuse of human body and plants are phenomena with Chinese characteristics - to twist and reshape nature to suit our personal taste, and to turn nature into our plaything. Li: Deformity becomes an object of desire and appreciation. Oh, it just occurred to me that an independent film forum was held when Songzhuang Art Gallery was opened officially. I remember that the documentary film Last Lumberjack had your name on its attribution list. I liked that film. My impression was that the trees, animals, and people were all on the brink of destruction. Did you yourself find the location where the film was shot? Shen: I knew of the place from Yu Guangyi. It is his hometown. He grew up there. He was very interested in the subject and mentioned it to me a few times. The trees there were all already cut down. The deforestation was complete. You might be wondering why they cut trees in that way? It wasn’t because China was so backward that they had to do it that way. It was because all there was left was wood for burning. You couldn’t use machines if all the trees were already gone. The only standing trees left were at the top of the mountains. Machines could get there, so they had to use horses and carts to move the wood down the mountains. Locals call this ‘taking off the hat (zhaimao)’, meaning that even the last bit of wood left on the tip of the mountains is being shaved off. Li: Did you put money into the making of that film? Shen: I did not sponsor the film. I only helped design it. Yu said there would be no more wood left there next year. So I felt it was necessary to record it. I went up there three times in the process of making the film. Life was very difficult there. Li: Apart from Last Lumberjack, you are also making a documentary about the intermingling of Chinese and Russians in a village on the Sino-Russia border. When did you start working on that project? Shen: I got the idea when I went to the village for the first time for an interview on the eighth of this New Year. 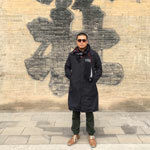 Shen: I was chatting to a friend in Harbin. He told me a story about a village where Russians and Han Chinese people have been living together for many generations. I found that interesting, so I went there through his help. My friends said that the place was about to be turned into a tourist attraction. Once that happens, all the interesting things will disappear very quickly. I was very moved when I learned about the place for the first time. They said that the Russians did not have shoes to wear when they arrived at the village. They had to wrap their feet in corn leaves and change the leaves every day. A lot of Russians arrived during the Second World War. Men died in the war. So women brought their children there to cultivate the wasteland. Some of them married local farmers and fishermen and stayed. It is now their fourth generation in the village. Li: So the migration started during the Second World War? Shen: Before that time, migration was a natural and slow process. The physical distance between the two sides was not great. People could walk to the other side on foot in the winter, so natural intermarriages did exist before the Second World War. According to historical records, intermarriage between China and Russian there dated back to the late Qing dynasty. But it was a rare occurrence at that time. During the October Revolution in 1917, some Russian aristocrats were driven out of Russia by the communists. Descendents of these aristocrats can still be found living in that village. Another big batch of Russians migrated there during the Second World War. Nowadays they think it is quite cool to have a Caucasian face. It looks pretty good. But things were different before when they wanted to marry a Chinese man or a Chinese woman to avoid discrimination. As you can imagine, the Cultural Revolution was a nightmare for them. Even today, they still feel a trace of lingering fear when they think about it. A lot of them came over during the war. So even today, there are still people without nationality. The Chinese government have issued them temporary documents as their identity cards. They need to produce these documents in order to take trains or stay in hotels. These are people without nationality – an internationalized group in a real sense. Their diet, religion and everything else are all mixed. It is an ‘international’ tribe created by particular socio-historical conditions, a group without a voice. Their Caucasian faces have the eyes of the ignorant Chinese peasants you see in remote regions. And when they open their mouths, what you hear is fluent Dongbei peasant dialect. They do not question their appearance, nor do they enquire about their ambiguous background. I recorded their lives because I wanted to find humanity in the record – do people retain their ethnic traits under different natural and social conditions? Are there constants in humanity across ethnicities? Li: Your works are very varied in content, genre and category. Now you are also making documentaries. Today you have talked about them in a comprehensive fashion, covering aspects of implementation and the formation of concepts and ideas etc. I am nothing more than a recorder, keeping a record for further research to be carried out by others in the future.